September 22, 2012, VICTORIA (ISN) – The Victoria Highlanders men’s prospects look towards retaining their VISL (Vancouver Island Soccer League) U-21 league title and BC Provincial Cup Championship, and the Peninsula Co-Op women’s prospects have an eye towards their second league win in the Vancouver-based Metro Women’s Soccer League, as both teams take to the pitch on Sunday. On Sunday, Sept. 23 the Victoria Highlanders’ Prospects men’s team will play their season opener against U-21 Bays United at Oaklands Park. In 2010, their debut season, the Prospects were crowned BC Provincial Cup Champions and have captured the VISL U-21 league title two years running. On the women’s side, the Peninsula Co-op Highlanders prospects are looking for redemption after a close game last weekend saw the squad drop the result 2-1 against first place team Columbus FC. 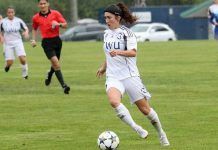 In early days of their inaugural season of competition in the Premier Division of the Vancouver-based Metro Women’s Soccer League, the women currently post a record of 1-1-0. The Peninsula Co-Op prospects will face the North Shore Girls Soccer Club Renegades, on Sunday. The NSGSC Renegades are only a point ahead of the prospects with a 1-0-1 record. Victoria Highlanders FC have launched an early bird offer for fans on 2013 Season Tickets. Those who purchase Season Tickets before Friday, November 30, will pay only $35, over 70% savings. Fans can take advantage of this offer and renew or purchase their Season Tickets online at www.victoriahighlandersfc.com or by phone at 250.590.VHFC (8432).